(Graphic Processing Unit) GPU Market is set to exceed 121,000 thousand units with a market value of over USD 80 billion by 2024; according to a new research report by Global Market Insights, Inc. The GPU market growth is attributed to a surge in the adoption of the IoT in industrial and automotive sectors. As the IoT devices gather huge amounts of data that needs to be tracked and analyzed, the demand for high-end computing system increases. This further propels the need for GPUs that provide the requisite support for analyzing complex datasets in a quick manner. 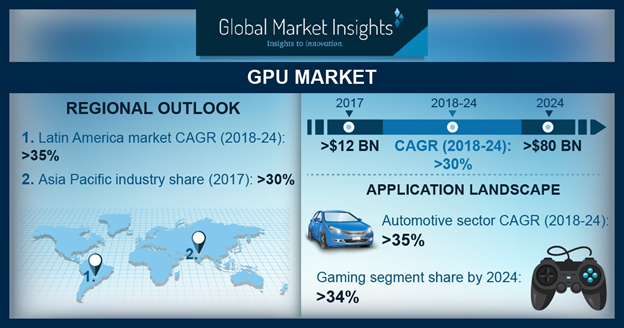 Other factors fueling the graphic processing unit (GPU) Market growth include various government-led investments in the semi-conductor industry and a rise in the uptake of the AI technology to drive innovations in sectors such as healthcare, automotive, and manufacturing. For instance, in April 2018, Google announced its plans to reinvent the U.S. healthcare industry with a focus on AI and data. The company is using its expertise in AI to create a new paradigm for the detection, diagnosis, and treatment of diseases. Bringing AI to healthcare will generate the need for graphic systems in image processing and rendering. It is expected that clinical health AI applications will create around USD 150 billion in annual savings for the U.S. healthcare industry by 2026. The increasing popularity of AI-based applications will compel GPU manufactures to develop new GPUs that run intensive machine learning algorithms efficiently. However, a declining market for cryptocurrency will affect the graphic processing unit (GPU) Market growth. Miners need high-end computing processors to build machines that mine bitcoin. As the value of value of cryptocurrency is declining, the demand for GPUs has also decreased to a greater extent. The GPU software market is projected to hold a market share of around 20% in 2024. CAM/CAD software is projected to hold a market share of over 40% in 2024 owing to the extensive use of these software in designing and manufacturing prototypes. Organizations first need to create visual effects for developing their products and then turn the designs into realistic products. As these software programs are extremely graphics-intensive, the demand for GPU-powered supercomputers will increase to support advanced computing capabilities required for the generation of models. The gaming application segment is expected to hold a major share of the GPU market accounting for over 34% by 2024. This market growth is attributed to the growing demand for high-resolution games. Tablet and smartphone penetration are fueling the growth of the gaming industry. For instance, according to the ESAC Report 2018, 80% of Canadians view video games as mainstream entertainment. Around 30% of Canadian gamers have purchased a digital download of the full game in the past 6 months. According to the Germany Trade & Invest Report, Issue 2016/2017, in Germany, PCs remained the biggest gaming platforms with 18.4 million active gamers, followed by smartphones (17.2million), consoles (15.6 million), tablets (11.5 million), and handheld devices (8.3 million). The growing use of gaming devices and popularity of online gaming fuels the demand for advanced graphic systems to support graphics-intensive gaming applications. GPU chip manufacturers are investing heavily in R&D and entering into partnerships to develop new offerings. For instance, in November 2016, IBM and NVIDIA partnered on a new deep learning tool optimized for their latest technologies. The new IBM PowerAI software toolkit is paired with NVIDIA GPUDL Libraries and NVIDIA NVLink, optimized for IBM power architecture. The solution enables 2X performance over servers and four GPUs running AlexNet with Caffe. In August 2018, UKFast launched FASTdesk GPU, a service that enables businesses to log into a desktop irrespective of the location or device, removing the need for investments in hardware. The service enables designers and architects to run applications, such as Adobe Photoshop, 3D CAD, and other graphic-intensive applications, with resources and performance accessed over the cloud. Some of the prominent players operating in the graphic processing unit Market include Advanced Micro Devices (AMD), Autodesk, Amazon Web Services, Cogeco Communications, Dassault Systems, Google, IBM, Intel, Microsoft, NVIDIA, Nimbix, Penguin Computing, PTC, Qualcomm, ScaleMatrix, Siemens AG, and S3 Graphics.